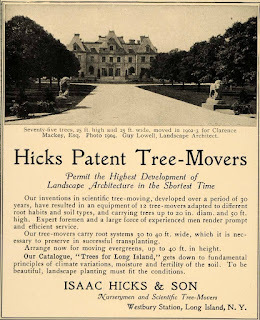 A 1904 tree advertisement for Isaac Hicks & Son showing 'Harbor Hill', the Clarence Mackay estate designed by McKim, Mead & White between 1899-1905 in Roslyn with landscaping by Guy Lowell. Click HERE for more on 'Harbor Hill'. If one enlarges the screen, one sees a lone little figure on the lower flight of steps, dwarfed by the excessive scale. Such a very magnificent, lonely looking place---or as Henry James said, about the Newport houses---"all cry and no wool"
Westbury Station? I never saw/heard that one before. I was curious about Westbury Station as well, and I believe it must mean the train station. What I found is that Westbury train station opened in 1834 -- when the LIRR began service to Hicksville. I am thinking that Hicks had an office in the station. I had no idea the LIRR had service that early. Of course, one click led to another which led me to eBay where there are a bunch of these Isaac Hicks ads for sale. The company was quite an advertiser which strikes me as rather progressive for that era. The usage is really all over the place. If you look at at a map from the late 19th century most of what is now Old Westbury and Westbury were known as Westbury Station (indeed because of the train stop). Even though Old Westbury was incorporated as a Village in 1924 you might find Old Westbury on the map as early as 1905. Sometimes the area was considered Roslyn. I.U. Willets Road was previously known as Albertson Station Road...which makes a lot of sense because coming from Old Westbury it takes you smack into the Albertson train stop. It does get confusing with all the hamlets, villages and towns. Locust Valley colloquially refers to the entire area of Lattingtown, Mill Neck, Matinecock etc. Locust Valley itself is a hamlet within the Town of Oyster Bay. Mill Neck is a village in the Town of Oyster Bay. Then there's the Village of Oyster Bay...located within the Town of Oyster Bay. Old Westbury is a Village in the Town of North Hempstead. All of the hamlets, villages and unincorporated areas fall into those three one way or another. Old Westbury straddles the boundary of the Town of North Hempstead and the Town of Oyster Bay. Don't tell a resident of Mill Neck that they have any association with Locust Valley. It really is based upon what post office serves your address and Locust Valley PO includes the villages of Lattingtown and Matinecock and they are all often referred to as LV. One can write LV as their address and the mail will arrive at their home in Matinecock. Mill Neck has their own post office branch and my mail is addressed soley to Mill Neck. What I was trying to get at is when you look at 100 year old publications...many times all it will state is Locust Valley when in fact it might today be Glen Cove, Lattingtown, Matinecock, Mill Neck, Brookville and parts of Oyster Bay. Once you get into mailings and zip codes and unincorporated areas and what not it becomes as confusing as the tax code. That's very interesting information about IU Willets Road as well. I grew up right off of IU Willets and never heard that either. I always thought the lines were blurred between Mill Neck and Oyster Bay. You can be a minute out of "downtown" Oyster Bay and be in Mill Neck. Growing up in Mill Neck, we did take some civic pride in our own post office, our own train station and our own police force. Man, you gotta wonder how the Mill Neck police kept busy. Those would no doubt be interesting police logs to read. Maybe it's different these days. I understand the LIRR no longer stops in Mill Neck -- I remember so many times coming to Mill Neck from NYC and you'd have to keep telling the conductor to stop in Mill Neck and often times the train wouldn't stop and then have to slowly back up. We relied on the Locust Valley fire department, not Oyster Bay, however. I believe I said 'very confusing'? I rest my case. 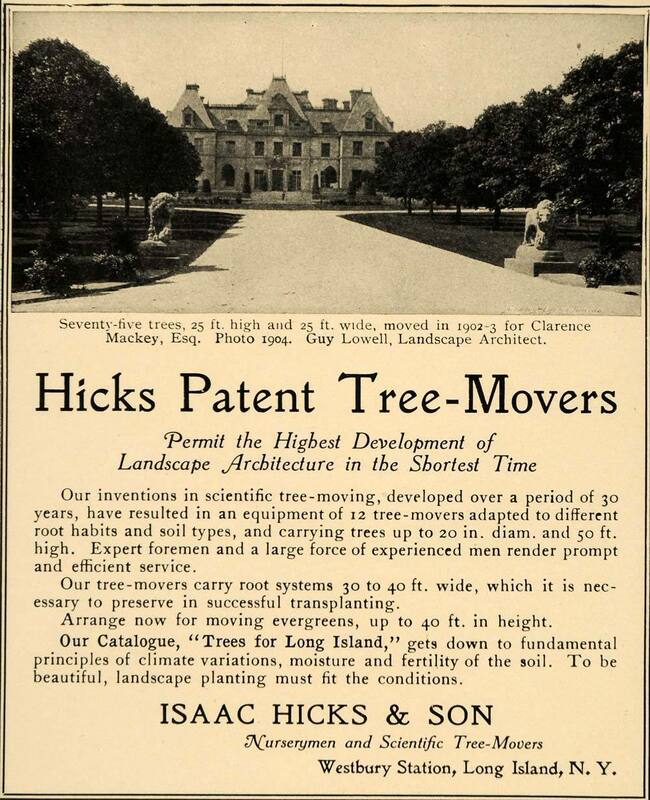 The Hicks company clearly had the lock on the tree moving business in the east. In the course of research, I find that they were brought to Maine at least twice, to move full grown trees for the Blair and Stotesbury estates.